Nothing changed. His sermons lacked power. He wanted to know more of God. He heard from someone’s testimony of being empowered by the Spirit. He, with a few friends, covenanted to pray and search the Scriptures until revival came. Praying over his next sermon, he was convicted of his pride in human methods. After wrestling through the night, he repented, and burned his precious well-constructed sermons. He called for a week of prayer. People filled the chapel and were saved. The following Sunday, most of the church was baptized. Revival spread through the valleys. Hundreds came to know Jesus. As Chadwick moved to other places, the revival followed. Chadwick spend his Saturdays with local workers. Once, when his wife was away, he invited anyone who was lonely to come for Saturday tea. God had awakened a baker during the night “to bake for all he was worth.” He provided the refreshments. In Leeds, in 1890, he was appointed superintendent of the Mission, “a haunt of criminals and a stronghold of vice, poverty and slum dom.” The chapel filled half an hour before the service. Police controlled the crowds. People came to God. The rough, dirty neighborhoods became clean and respectable. The Chief Constable wrote his thanks. Twenty-five came to know Christ that night. He preached with Moody at the Chicago Exhibition in 1893. In 1907, he tutored at Cliff College. In 1911, in the middle of a labor dispute, he held open-air meetings at Cardiff docks. On Mondays in villages, his terse, epigrammatic sermons brought farmers from miles to hear. His titles included “The weather and the Word—for as the rain comes down and the snow from heaven,” based on Isaiah 55:10. At the end of the Great War, he conducted a Thanksgiving service at Royal Albert Hall, the first in English history when the King and Queen attended a Nonconformist service. The following year, revival came to Cliff College and Chesterfield. Men knelt in the streets confessing their sins. After Thomas Cook’s death, Chadwick became principal of Cliff College. He demanded discipline. Chadwick pointed to the seat beside his desk, “Sit down in that chair and die.” Chadwick knelt with the student and prayed until the craving disappeared. Chadwick edited Joyful News, a weekly evangelistic paper. Chadwick wrote fairy stories for the Christmas edition. One was sent to Princess Mary for her wedding. He wrote The Call to Christian Perfection, Humanity and God, The Path of Prayer, and What is Meant by Conversion. His frail, small body kept him going for 72 years, as he sought to know God. 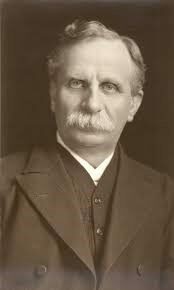 Samuel Chadwick died Sunday morning, October 16, 1932. But like Moses, Samuel Chadwick left behind words that told where his heart lay. Evangelical Times. Samuel Chadwick. n.d. http://www.evangelical-times.org/23802/samuel-chadwick-1860-1932/ (accessed May 30, 2017). Jesus Army blogs. Radical Christian History: Preacher Burns His Sermons Then Catches Fire HImself. May 20, 2007. http://www.jesus.org.uk/blog/radical-christian-history/preacher-burns-his-sermons-then-catches-fire-himself (accessed May 30, 2017). Telling Ministries. Quotes by Author--Samuel Chadwick. 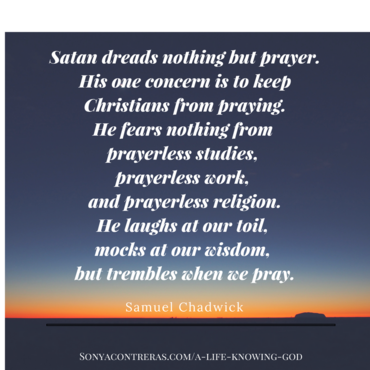 n.d. https://www.christianquotes.info/quotes-by-author/samuel-chadwick-quotes/?listpage=2&instance=2#participants-list-2 (accessed May 30, 2017). Turnham, Joe. Samuel Chadwick. June 9, 2011. http://www.joeturnham.com/Articles/Article.aspex?ai=116 (accessed May 30, 2017). Wikipedia. Samuel Chadwick. n.d. http://en.wikipedia.org/wiki/Samuel Chadwick (accessed May 30, 2017). What do you do to make sure that you pray? What an inspiration he is, thanks so much for sharing. God bless.